Update: Part II Using Google Maps with a Mobile GPS Tracker is online. My goal is to build a kind of a mobile tracker. There are many different use cases you can think of but one of the obvious is a device, that is able to report where it is. This device can be put in your car and it could trigger an alarm, if the car got stolen. Actually it could tell you where it is. There are already mobile tracking devices out there, but they seemed to be too expensive and too closed for my needs. Another option is one of these new Nokia N95 which have built-in GPS. They are really nice, but about 600€, which is not a bargain. So I decided to do my own. 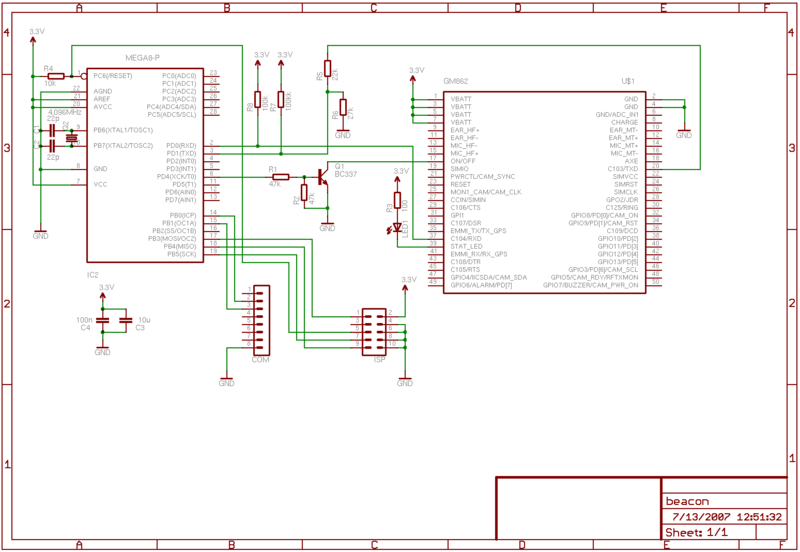 So my first idea was to combine a microcontroller with a GSM and a GPS modul. There are a lot of these modules over at Sparkfun, for example. 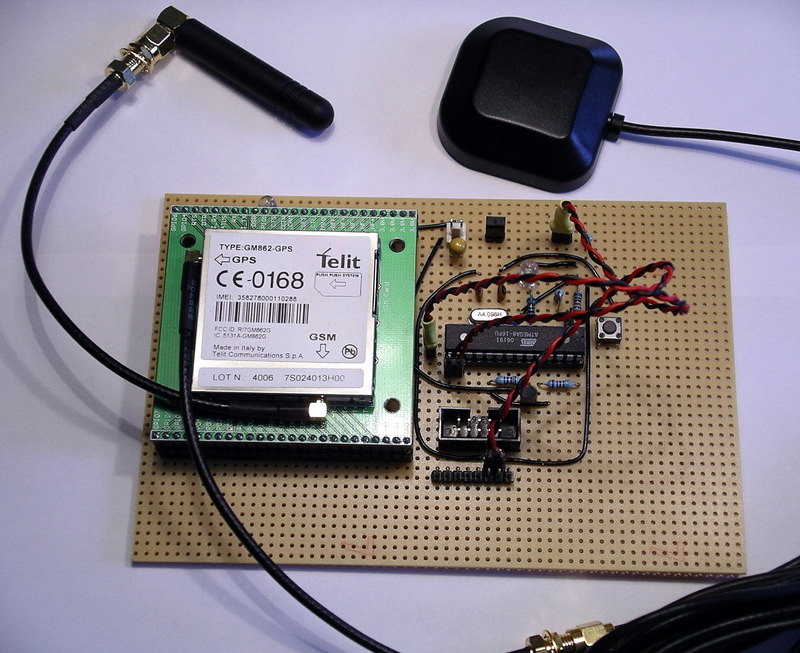 Looking through their shop I found the Telit GM862, which is a GSM modul with an built in GPS receiver. That is what I wanted. And they sell great break out boards to make it easier for hobbyist to access these modules. Voice means you are not limited to mobile tracker applications. You could attach a speaker and a microphone to build a complete mobile phone! So here is a list of what I purchased to get the first integration done. Summing up you get all parts at about 220€ or $286. Ouch! Who said, that tinkering with electronics is a cheap passion? But again, if you go this way, you can implement anything you can think of. Looking at the specs for the GM862, you realize, that it is more complex as you might have thought. A problem for me, still a beginner in electronics, were the different voltages used for the module. The power supply has to be 3.4-4.2V. Thats ok as an AVR can run on that voltage. But the serial port requires lower levels, 2.8V (CMOS). That means, you can not connect the UART of the controller directly to the module. You have to do some level translation. Fortunately this has already been solved over at Trackbox2. Another point to mention is the power supply itself. It requires at least 2A for peaks. I used a LiPoly rechargable battery, which perfectly fits my needs. If you have to use 5V supply, you will have to use a capable voltage regulator and you have to deal with the CMOS voltage level issue as well. RTS to ground, no handshake is used. Please keep in mind, that this is not an enterprise grade and production like circuit, so read any spec and guide before you assemble your components. You have been warned. That’s it so far. It cost me quite some energy and money but was worth it. Next time more on software and how to talk to the GSM module. Trackbox2, great information about interfacing an AVR to a GM862, helped me a lot. In german. Portable Rotary Cellular Phone, tutorial at Sparkfun on how to use a GM862. There is also a forum, that has informations about GSM and GPS. roundsolutions.de, retailer for the GM862 with a great forum. Telit, all specs and guides for the GM862. According the datasheet the GM862 runs on 3.8V (3.4V – 4.2V), but on the schematic it is shown connected to 3.3V. Is there a typo on the schematic, or are you running it outside of spec? Good catch. It’s a typo. I used a 3.7V LiPoly battery to power it.